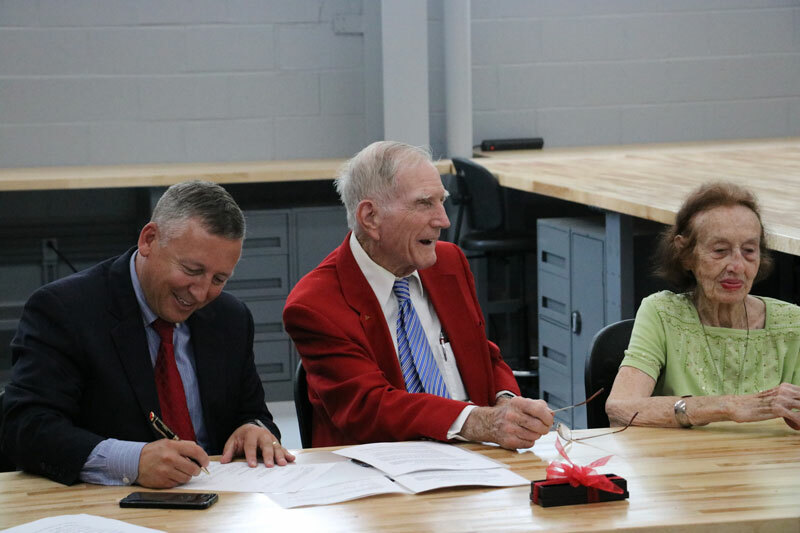 Dr. Charlie Suggs and Jane Suggs established the Charles W. Suggs Distinguished Professorship in Biological and Agricultural Engineering Endowment on his 90th birthday in Weaver Labs. See the celebration in photos. Experience Spring 2018 Graduation through this wonderful video of the event. The College of Engineering honored BAE seniors for scholarship, leadership, humanities and citizenship and service. This year two BAE seniors were selected as COE winners in the scholarship (Dani Winter) and citizenship and service (Matthew Parker) categories! Dr. Natalie Nelson’s research was featured in Environmental Monitor. Dr. Natalie Nelson also received the 2017 Best Doctoral Dissertation award from the University of Florida Institute of Food and Agricultural Sciences. Dr. Andy Hale‘s BAE 100 class raced again in the annual Edible Car Competition and was featured in a video by CALS News. BAE students tackle real world problems in Senior Design. Outstanding AET and BE seniors were honored at the BAE Student Awards Banquet. Dani Winter received a NSF Graduate Research Fellowship. Dr. Mohamed Youssef was promoted to professor, visited by NC State College of Agriculture and Life Sciences Dean Richard Linton and College of Engineering Senior Associate Dean Harry Daniels. Neil Bain was honored with the CALS Safety Award. NC State BAE alum Theodore Endreny and his research team calculated just how much a tree matters for many urban areas, particularly megacities. Join us in Detroit at the 2018 ASABE Meeting: The NC State BAE Social at the 2018 ASABE Annual International Meeting (AIM) in Detroit will be Sunday night (July 29th) starting at 6:00 PM at the Firebird Tavern (419 Monroe Street). If you are interested in attending, please RSVP to gafox2@ncsu.edu by June 15th. The cost is $20 per person. All alumni and friends of the department are welcome to join us. Tell us your story! Send us your news! You can submit news and information to Rebecca Nagy at renagy@ncsu.edu.